The United States has felt the impact of climate change. Six climate change-related events in the United States have accounted for about $14 billion in lost lives and health costs. Climate change occurs when the surface of the earth’s environment changes and has the potential to reduce the quality of life on earth. This column defines climate change and explains how it affects human health and health costs. It is based upon the 2011 Union of Concerned Scientists’ report that identifies who is responsible for climate change. Vtousek in a 1994 article, “Beyond Warming and Global Change,” and Hughes et al in the 2003 article, “Climate Change, Human Impacts, and the Resilience of Coral Reefs,” both claim that climate change and global warming is caused by human activities. There are others who believe it is a result of natural changes in climate. According to the Environmental Protection Agency (EPA), climate change is defined by “…any significant change in the measures of climate lasting for an extended period of time.” This can refer to major changes in temperature, precipitation, wind patterns and other effects that happen over several decades. In 2012, The World Health Organization (WHO) reported that climate change has an effect on the social and environmental factors of health, such as clean air, safe drinking water and sufficient food and secure shelter. The EPA records that scientists accept the truth about a warming climate and the changes that it will bring to water supply, agriculture, power and transportation systems, the natural environment and health and safety. There is evidence that supports the notion that the climate is changing. For example, global average temperature has increased by almost 1.4°F over the last century. Scientists project that the Earth’s average temperatures will increase between 2 and 12 degrees Fahrenheit by 2100. Several human activities like increased carbon dioxide in the atmosphere currently appear to affect climate change. Such increase is acknowledged as responsible for global warming i.e. increases in global temperatures. According to the EPA, changes to temperature and atmosphere will harm plants and animals. Moreover, as more carbon dioxide accumulates in the atmosphere as a result of increased burning of fossil fuels, changes need to be made in human activities to reduce the adverse effect of climate change. 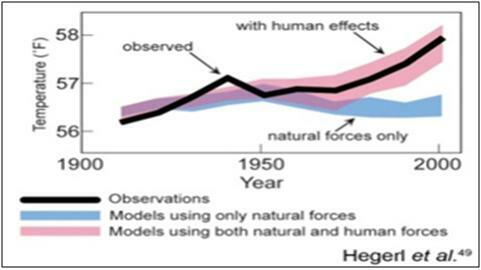 The figure below shows the steady rise in global temperatures, according to the National Academy of Sciences (see figure 1). The black line, year 1900 to 2000, indicates the observed average global temperatures along with the temperature ranges anticipated by climate change models. It also shows the increased temperatures due to human activity and environmental factors. According to the WHO and several research reports, climate related injuries and diseases account for more than 5.5 million healthy life years lost annually. Knowlton et al. in 2011 estimated that health costs associated with climate change and specifically the six events that struck the United States from 2000 to 2009, was more than $14 billion. This included 1,689 premature deaths, 8,992 hospitalizations, 21,113 emergency room visits and 734,398 outpatients visits. These events involved ozone pollution, heat waves, hurricanes, infectious disease outbreaks, river flooding and wildfires. However, these costs did not include the economic burden from other types of damage, such as damage to buildings and infrastructure. Additionally, they estimated that health care funding of almost $740 million would be needed to address the diseases and injuries resulting from these events, which reflect more than 760,000 encounters with the health care system. In this column, we fault loopholes in the country’s laws and the irresponsible approach of policy makers and corporations. Climate change has been affecting, and will continue to affect, all human beings. From rising temperatures and unexpected weather events, like the first ever July cyclone currently near the Solomon Islands. Authorities, public-private actors and individuals must pay attention to human activities. It is the time for government officials, businesses and individuals to collaborate to reduce greenhouse gas pollution. Governments from around the world should develop laws and actions to protect human health from climate change. These rules should guide carbon dioxide reduction and other greenhouse gas emissions. Further, national governments should be proactive in determining ways to provide transport that is less reliant on fossil fuels. As discussed by the WHO, better and more appropriate food and energy use choices would result in a wider range of human activity with smaller footprints. It is essential that governments genuinely consider and take action to reduce global warming and help human health, the economy and the environment. Author: Dr. Mehmet Yesilbas, Ph.D., MPA, LL.B is a district governor, attorney at law, Turkish Interior Ministry, College of Health and Public Affairs, Doctoral Program in PA, Governance and Policy Research Track. Dr. Yesilbas can be reached at [email protected].